There's also the size of the fair to think about. Behemoth fairs like Basel can be very exciting, and will feature more prominent galleries and artists you're more likely to have heard of. There's typically more of a "seen and be seen" kind of vibe, and the works are more likely to be at a higher price point. While there are many more options to explore, they also have the higher chance of wearing you down. (It even has its own term: "Fairtigue.") Smaller fairs are more accessible both in scope and in price. It's less likely that you'll find the biggest names there, but there's also the thrill of discovery. You can have the opportunity to build up your collection with artists you've found first. For contemporary fairs, if you're interested in uncovering the most current trends in the art world, smaller fairs are the best way to stay in the know. Except for the smallest fairs, the truth is you're never going to see everything that's on view. Walking into the fair unprepared can make the whole experience seem even more intimidating, so it's best to put in some due diligence before you arrive. Take a look at the list of galleries that will be exhibiting at the fair and explore some of their websites. (For the larger fairs, there can be hundreds of galleries, so even this requires a bit of blind picking and choosing.) Don't overlook satellite shows, if there are any, especially if you're interested in the cutting-edge. If you're doing your research a few weeks in advance, sign up for the mailing list of the galleries that catch your eye. Most galleries will send out information about exactly what they'll be bringing to the fair a week or two beforehand so you'll have even more of an idea of what you'll be prioritizing. If it's closer to the show, check out their social media accounts, where they'll probably be posting sneak peeks of the works they're prepping to bring with them. Once you've picked out some of the galleries you know you don't want to miss, download the fair's map and mark their booths so you can plan your route. If the fair doesn't have a map available beforehand, just write yourself a list and do this first thing upon your arrival. Don't rule spontaneity out, though. Getting distracted by a great piece of art you're passing by is part of the fun! If you already have a relationship with galleries that will be at the fair, see if they have any VIP tickets available. VIP status gets you early access to the show so you can have the first look at what's available, and a better chance at buying what you find. (These events are called the "vernissage.") Your ticket may also get you access to special events or amenities. If you don't have a relationship with any galleries, a limited amount of VIP tickets are available for sale. You'll also want to see if there are any events or programs the fair is hosting in addition to the fair itself. Talks, demonstrations, and social events can break up your visit and add to the experience. Draft yourself a rough schedule, make sure you know how to get there, charge your phone, and don't forget your tickets. When you're actually at the fair, your key to survival is taking pictures and taking notes. Any time something catches your interest, snap a picture and write down a brief description (so you'll know which photo the notes correspond to), the gallery where you found it and their booth number, the title, and the artist. This will help you keep track of any booths you want to return to after you make your first round, or of galleries you'd like to keep track of or inquire with after the frenzy of the fair. Sign up for the gallery's mailing list so you can stay in touch about exhibitions, new artists, and new works that you already know you'll have a higher chance of being interested in. It's also smart to utilize social media to help navigate the fair. Find the fair's hashtag and search it on Instagram to discover galleries and pieces that other people are loving but you may have missed. Master the art of schmoozing, too. You don't always have to worry about keeping on track. Part of the fun is meeting other people in the art world and getting a bit of the inside scoop. If you're drawn to a particular artist, ask the gallerist questions about their work, their story, their process. (But if the interest is more out of curiosity rather than investigating a potential buy, read the room: If the gallerist is already wrapped up in making a sale, you can always circle back. Or if you're already in a conversation with them and another person seems interested in asking questions, let them go.) Networking is an important part of art fairs. Developing relationships with galleries that suit your taste can reap benefits down the road. Found something you're interested in? Fairs can create a bit of a competitive atmosphere, so you may feel pressure to act fast. If you're visiting at the beginning of the fair, talk with the gallerist about putting a hold on the piece. This keeps it technically off the market while you get a chance to think about it. But, unlike the usual visit to a gallery, the limitations for a hold at a fair can be only a matter of hours. If the piece you like already has a hold on it, let the gallerist know you're interested too. If the first person passes, you'll be in line without having to circle back and checking on it. If you're hesitant about the price, it's okay to discuss discounts, but you'll have more luck in actually getting one closer to the end of the fair. Feeling a little more prepared and ready to go? 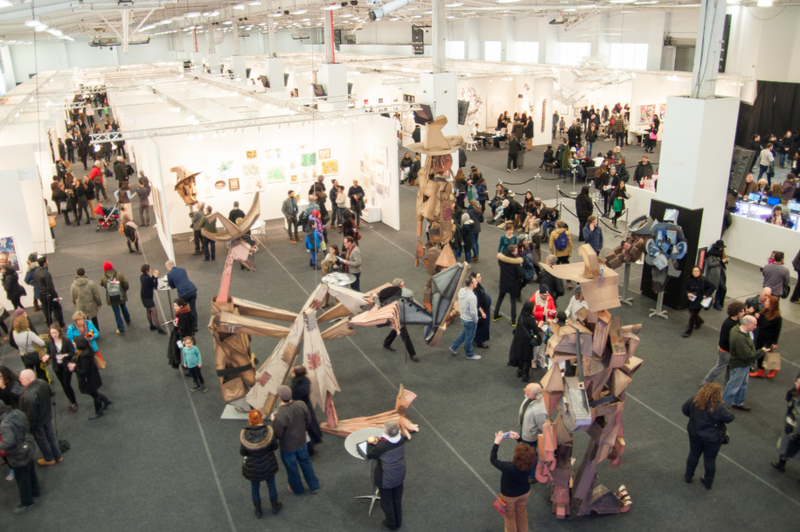 The next art fair we'll be participating in is Art on Paper in New York, March 3rd - 6th!